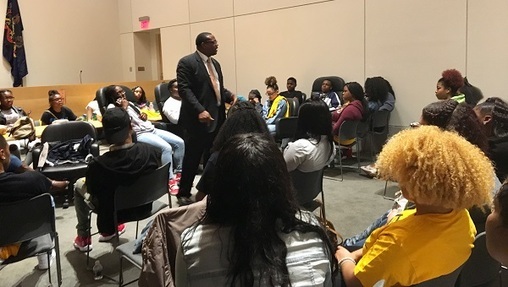 HARRISBURG, PA (WSKG) — Crowds of students and activists flooded Harrisburg Tuesday, calling for changes to help halt school shootings. It’s not the first time there’s been a push like this in the Capitol. In fact, it’s not even the first time this year. Similar efforts have happened behind a range of bills over the last several legislative sessions–usually after mass shootings, like the one in a Texas school last week that killed ten. Almost none of the measures, however, have been signed into law. This time around, lawmakers and advocates have identified at least a few areas that might have enough support to pass the legislature. A proposal that would make it harder for convicted domestic abusers to possess weapons passed the Senate unanimously and is on-track for House consideration in the near-future. It also has the blessing of Democratic Governor Tom Wolf. Plus, there’s a so-called “red flag” bill with bipartisan support that would let police or family members request a court temporarily seize guns from a person in crisis. Shira Goodman, with CeaseFire PA, said while she’d like to make major changes to assault weapon and ammunition sales, she’ll settle for proposals that can actually pass. A measure expanding background checks to include gun show purchases also has some bipartisan support, but may not have enough to pass the Republican-controlled legislature. Standing outside a conference room where Philadelphia and Pittsburgh high school students were discussing urban gun laws, Shannon Williams, also of CeaseFire PA, said one of the group’s key goals is knocking down a proposal that would let schools allow trained employees to carry guns. The bill’s largely-Republican backers say it would merely give schools more options for their own safety measures. Along with regulatory changes, there has been talk of routing more money for schools to bulk up existing security. Though there has been little concrete action thus far, Senate President Pro Tempore Joe Scarnati, a top GOP official, said this week that it’s a priority he’s planning to shoehorn into impending budget negotiations.